A scintillating first half to open the World Cup was marred by second half officiating of the sort that lends credibility to rumors of matching fixing. Brazil earned 2 points they probably didn’t deserve, and Yuichi Nishimura will have much to answer for if Croatia does not reach the knockout stage. Brazil were clearly in more of a 4-3-3 than 4-2-3-1, but what was even more noticeable was Neymar’s central position. In addition, Oscar played right and Hulk left, opposite their more traditional sides (though usually central, Oscar is more likely to play left than right). Michael Cox, in his typically excellent review of the game, offers a likely rationale for Big Phil’s unexpected deployment of his attackers. 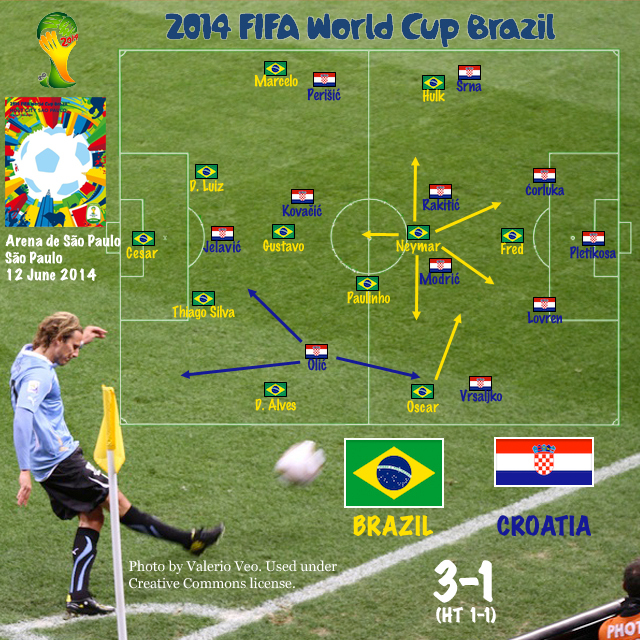 Croatia, on the other hand, were a regimented 4-2-3-1, both Modrić and Rakitić staying deep. Kovacić, on the other hand, was playing high up the pitch to help Jelavić both in attack and with pressing, which left a lot of space between attack and defense in the middle of the park. It was the flanking attackers and their service from the midfield duo that bridged the gap–for the most part, effectively. In the second half, Croatia were the better side (as they had been, though in a more reactive mode, in the opening 5′), retaining more possession and sending more long through passes up the middle as well. Yuichi Nishimura (Jap) – While it would be unfair to compare Nishimura’s officiating to the outrageous performances in the African Cup of Nations, he certainly raised memories of World Cup 2002. The go-ahead penalty was an indefensibly bad call, even though Nishimura had a more difficult view than television audiences; and while instant replay ultimately convinced me that the goaltender encroachment call on Olić that took away an 83′ equalizer was correct, it was still a 50-50 call and followed Hernanes’s uncalled body block on Rakitić, a clear obstruction, in the build-up. As Jonathan Wilson has recently written, the worst thing about match fixing is that it leads fans and players to doubt whenever the improbable does happen. Nishimura probably just had a bad day, but you will have a hard time convincing Croatian fans of that. Oscar (Bra) – It’s nice to see that almost everyone is recognizing Oscar’s central performance in the game. That was true even before his excellent late goal, and while Neymar was also fabulous in attack, it was Oscar who created the majority of those chances. Brazil was clearly a two-player team on the day, and Oscar was the most important by a stretch–on defense as much as in attack. He is clearly Brazil’s most important player at the moment, though Neymar is a very close second. They will need more help if Brazil is to prove the bookkeeper’s right in this tournament. Ivica Olić (Cro) – the 34 year-old striker was probably Croatia’s best player, with no disrespect to the excellent games of Modrić, Peresić, and Rakitić. He did everything for the team up and down the left flank as well as cutting inside to attack. When he moved to his more traditional role as a central striker following the 78′ replacement of Nikica Jelavić by winger Ante Rebić, Olić was a 50-50 call away from putting his team in a position to earn a point off of Brazil. Notwithstanding this undeserved loss, it would be surprising–and deeply disappointing–should Croatia fail to advance. CORRECTION: An earlier version of this post misspelled Yuichi Nishimura’s name. Thanks to a friend for alerting me to the error.